Our CEO Peter Brown recently spoke about the implications of a no deal Brexit with Yorkshire Business Insider following the our positive financial results. In the interview, he said that a no deal Brexit would be a ‘huge step backwards’. 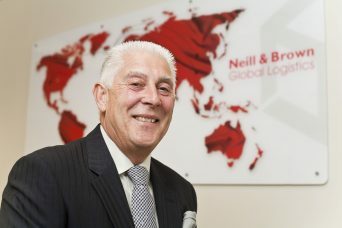 “While we have achieved continuous growth and more employment at Neill and Brown, a no deal Brexit will have serious consequences for us and the industry as a whole. “Over the years, logistics companies have developed supply chain systems to deal with demand from international trade – not only heavy investment in equipment, but also in IT systems to monitor timed deliveries and collections. A no deal could render this type of ongoing investment pointless. “A large proportion of our business is driver accompanied and we have been informed by the Road Haulage Association and the Department of Transport that, in the event of a no deal, we will have to revert back to a permit system for vehicles to enter Europe, which we had over 30 years ago. We have been advised that there will be approximately 2,000 permits up for grabs, yet there are over 20,000 UK trucks that complete international movements on a yearly basis. “No one has been able to tell us if the same restrictions will apply to foreign registered vehicles attempting to enter the UK. If the permit situation is not reciprocal then it would cause international UK logistics companies severe hardship. You would see queues of vehicles waiting at ports and serious congestion. “The government, in its wisdom, is advising manufacturers and hauliers to look at alternative means of transporting goods to and from Europe. Most shipping lines from this area are already full to capacity, so there is not really any alternative unless more shipping lines extend their services. “Our borders must be kept open to free movement of goods. If there are duties to be paid on imports, it will create large revenues for the government, but also increase the costs of goods to public as the extra costs must be passed on. It will subsequently increase inflation and in turn affect investment in this country. “If we have to complete customs documentation on both import and export consignments, it will not only increase costs, but could cause serious delays at border crossings, especially Dover. The story was published on November 19 and made reference to the growth of the company since our 100 year anniversary celebrations in 2017.